Sit, rollover, calculate Pi to the 90th digit. In 2015, The New York Times debuted a short documentary called “A Robotic Dog’s Mortality.” The film profiled a woman named Michiko Sukurai. She owned an Aibo, a robotic dog sold by Sony between 1999 and 2006. Recently, though, Sukurai and many like her suffered a loss: in 2014, Sony announced would no longer repair the robo-pets. After that, owners and were on their own. Sukurai, in particular, struggled to come to terms with the impermanence of a companion she’d grown to love — one that was never supposed to die. As it turned out, that wasn’t the end of Aibo’s story. At a press conference held in November 2017, Sony made a surprise announcement. It would begin manufacturing the iconic dogs once again, this time with all of the bells and whistles of modern robotics: OLED eyes, built-in LTE, facial recognition. Aibo owners, it seemed, were finally getting the ‘forever friend’ they were promised. This same connection is seen in Sparky, the fifth episode of Glimpse, a new original sci-fi series from Futurism Studios (a division of Futurism LLC) and DUST. Watch the episode below. Michiko Sukurai’s story isn’t unique in the world of robotic pets. Scientists have long understood the psychological benefits of computerized companions. Studies have shown they can help combat loneliness among the elderly, motivate students in isolated communities, and even improve symptoms in dementia patients. Scientists have long understood the psychological benefits of computerized companions. Still, despite all of this research, one big question remains: are robotic pets as good as the real thing? The robots of yesteryear clearly were not. In 2009, researchers conducted a series of studies that looked at the emotion with which children responded to Aibo robotic dogs and live dogs. 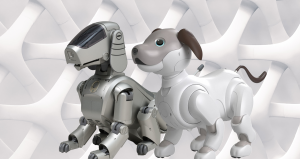 They discovered that while the children did ascribe thoughts, feelings, and social value to Aibo, they also showed markedly less attention and affection toward it than they did the real dogs. That isn’t surprising, since early Aibo units were so simplistic. Even the most advanced models were limited to 128mb of memory, barely enough to hold a copy of The Beatles’ “White Album.” Robotics has come a long way since 2006, though, and the field continues to evolve even more rapidly thanks to advances in artificial intelligence, machine learning, and microprocessing. In the future, though, it’s not going to be so obvious whether or not robotic pets are as good as the real thing. To figure it out, we need to determine what makes dogs so lovable in the first place. According to Ronald Arkin, director of the Mobile Robot Laboratory at Georgia Institute of Technology, it all comes down to basic biology. Arkin calls this area of study “behavioral simulation ethological modeling,” and he’s been doing it for a long time. He believes all aspects of animal behavior — “movement, emotion, even morality” — can be authentically simulated in robotic companions. He says he holds patents on robot “emotions” and is currently working on simulating feelings like guilt, shame, embarrassment, and empathy in robots to prove out his theories. For Arkin, though, it isn’t enough to build a robotic dog that’s as good as the real thing. He believes he can build one that’s better. While Arkin’s “perfect” robotic dog may not be here for a few years, he’s pretty enthusiastic about where the field seems to be headed. He believes the next generation aibo (it wouldn’t be a reboot without a letter case facelift) is miles ahead of the competition. Perhaps Michiko Sukurai was onto something. Artificial Intelligence Is Automating Hollywood. Now, Art Can Thrive.